There are many devices that generates or made to generate DC voltage. Some of those are wind turbine-generator-rectifier, hydro turbine-generator-rectifier, PV solar, CSP-generator-rectifier, geothermal generator-rectifier, fuel cell, flow cell, electro-chemical energy storage devices (Super Capacitor, NaS battery, etc.). PSG is a cost effective bi-directional device where its input is DC and its output is 3-phase, AC voltage. It is a true maintanence free device designed for utility applications. Innovative packaging is utilized to reduce PSG cost that is a critical barrier to utility application. The control algorithms for the power circuit is done independently. This allows the design to be scaled up by increasing the power circuit capacity without modification to the control circuit. 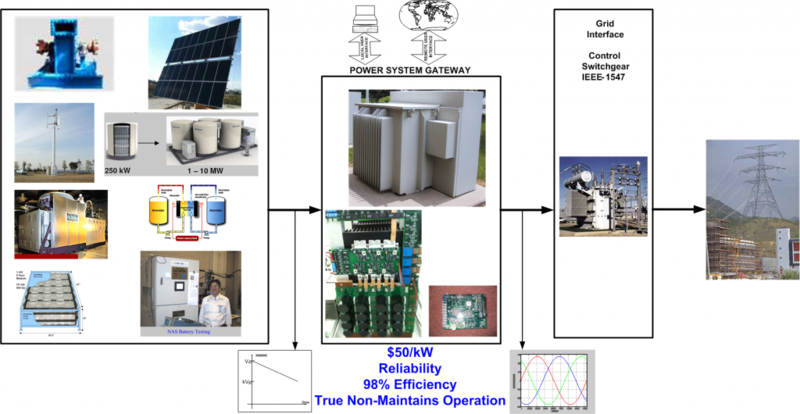 The design also facilitates parallel operation of PSG units and allows additional scale up capability to hundreds of megawatts. Power System Gateway objectives are : Utility application, Shunt operation, Inject/sink active/reactive power, Cost at $50/kVA, Reliability for Power System Application, Maximized Energy Efficiency, 98%, True Non-Maintains Operation, User friendly device, Enviromentaly friendly device, Smart, Long life, Manufacturability/modularity, Outdoor/indoor operations.